About a two-hour ride from New York City or Boston, New Haven holds its own with culinary, cultural and historic offerings. And sorry, Manhattan: this Connecticut city was ahead of you in getting a grid plan. Founded by English settlers in 1638, New Haven was shortly after laid out as the “Nine Squares,” a grid setup of the same number with its common space now being the New Haven Green. Present day New Haven has been on a solid upswing. Every June, the International Festival of Arts & Ideas hosts performance artists, musicians and speakers from all genres at locations throughout the city. Dining in New Haven is part melting pot, part experimentation as immigrants and inventive chefs continue to infuse their culinary influences. Nightlife involves cocktail bars and live music venues, and theatres and museums also provide much to do. And we haven’t even mentioned Yale yet. New Haven’s greatest culinary addition is “apizza”—a version of pizza that’s a plain tomato pie with a sprinkling of grated pecorino Romano and a crust that is thin, crispy and charred from being traditionally baked in a coal-fired oven. This Neapolitan style is linked to southern Italian immigrants who settled in New Haven and opened businesses selling this dish. One place that has put New Haven pizza on the map is Frank Pepe Pizzeria Napoletana, or simply known as Pepe’s. In business since 1925, this family-owned institution gets diners lining up outside its flagship location on Wooster Street for pizzas such as their original tomato pies and their invention, the white clam pie. A respected rival to Pepe’s, fellow New Haven long-timer Sally’s Apizza was opened in 1938 by Frank Pepe’s nephew, Salvatore Consiglio, and makes similar Neapolitan-style pizza. Other pizzerias to include: Modern Apizza, with mozzarella-based pizza specialties like its Italian Bomb with seven hefty toppings (bacon, sausage, pepperoni, mushroom, onion, pepper and garlic); and BAR (pictured above), a pizzeria and nightclub noted for its mashed potato pie. Founded in 1701 in what is now Old Saybrook, Connecticut, this Ivy League institution (pictured at top) was moved to New Haven over a decade later and has been a fixture in the downtown area ever since. 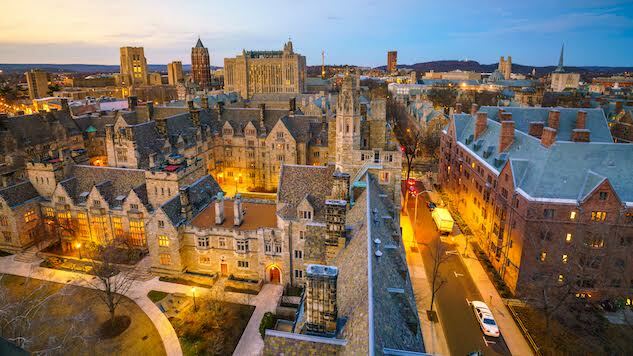 As an easier way to “get into Yale,” take a student-led campus tour. Tours start at the visitor center and highlight the university’s history and offer some trivia. Highlights could include the Beinecke Rare Book & Manuscript Library, with an interesting marble paneled exterior that filters outside light and whose collection contains a copy of the Gutenberg Bible. Or go solo with self-guided tours focusing on public art or a “Women at Yale” themed itinerary. Reopened publicly in May 2016 after a major building conservation project, this museum/research center provides a great introduction to British art. The Yale Center for British Art holds the largest and most comprehensive collection of its kind outside of the United Kingdom, encompassing drawings, paintings, manuscripts and sculptures from the Elizabethan period onward. Along with seeing its massive Reference Library, linger along the fourth floor Long Gallery, a sweep of seven bays graced from floor to ceiling with more than 200 works such as portraits and landscapes. And admission to the museum is free.